For fans who were expecting Ryan Reynolds and most of the cast of Deadpool 2 to share some details on the upcoming X-Force movie, you're out of luck. Today's San Diego Comic-Con panel was strictly to celebrate the Deadpool franchise and pay tribute the fans that made the movies so successful. However, Ryan Reynolds did reveal that he thinks Green Lantern and X-Men Origins: Wolverine are pretty awful. The panel was moderated by Karan Soni, who plays the Merc with a Mouth's unofficial partner Dopinder, and featured Reynolds, Zazie Beetz, Brianna Hildebrand, and Stefan Kapicic as well as director David Leitch and writers Paul Wernick & Rhett Reese. The cast and crew of Deadpool 2 took some questions from the enthusiastic audience and one person asked Ryan Reynolds which movie he hated more: Green Lantern or X-Men: Origins. Both films haven't aged well over the years and might not have even looked good upon their respective releases. Reynolds took the question in stride and had the perfect answer. He noted that he was grateful for the "wellspring of awesome jokes" for Deadpool and that he appreciated both movies. He had this to say. "Both were amazing experiences and I had a ball making them. As an actor, you are blessed to be in that position to shoot any movie that size, so I appreciate the chance... But yeah, they are both pretty bad." X-Men: Origins was the most successful out of the two projects, earning $373 million worldwide off of an initial budget of $150 million. 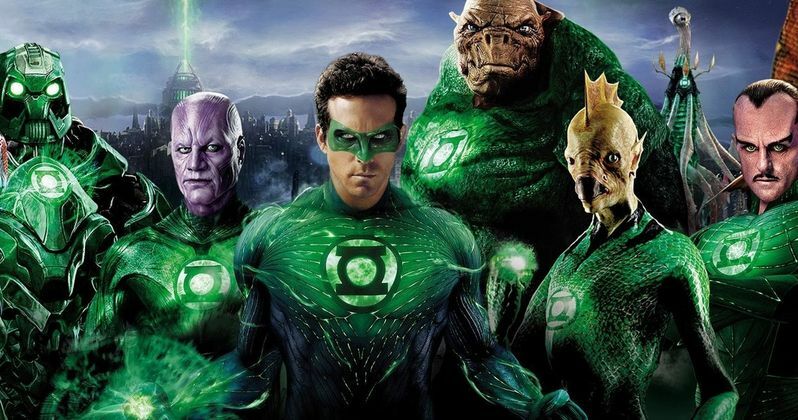 Green Lantern was less fortunate, but was still able to clear its budget of $200 million by earning $220 million worldwide. Still, both film allowed Ryan Reynolds to be where he's at today, and like he said, they've given him so many jokes for Deadpool and Deadpool 2. As to be expected, the Deadpool 2 panel at Comic-Con was hilarious and started off with the extended opening scene of the sequel, which will be shown later tonight at the "Super Duper" premiere. Ryan Reynolds was seated at the end of the table, but he was not the last person. Instead, there was an empty chair with a Vanisher name plate, for the invisible X-Force member who had an unfortunate run in with some powerlines. Reynolds was really appreciative of the crowd and stated how much they helped get Deadpool 2 made into a reality. Related: Proof Green Lantern Unites the Seven in Justice League? Ryan Reynolds even admitted during the panel that he originally wanted to play the Wally West version of the Flash, which would have been pretty interesting. But it looks like DC is finally getting their Flash movie off of the ground, or at least it seems that way. Elsewhere, the Deadpool 2 panel was basically just one giant celebration with no real scoops given, just gratitude to the fans who allowed them to make the movies. Is Christopher Nolan's Secret Movie Green Lantern Corps.? Does Justice League Have a Green Lantern Cameo? Justice League Green Lantern Cameo Spoiled by Big Bang Theory?